We’re told to embed social studies curriculum into language arts, but what if we flipped that idea around? What if we integrated reading and writing into social studies activities? Want another fun social studies activity? We’re giving away 50 social studies board games designed by HMH Kids Discover to inspire students to learn about their community and the world around them—through play! Enter here. Is anyone else wondering where social studies went? Teachers are facing time crunches, and dedicated social studies lessons are slowly being squeezed out of our elementary classrooms. We’re told to embed social studies curriculum into language arts, but with very little guidance or materials, it doesn’t always go well. But what if we flipped that idea around? What if we integrated literacy into social studies? 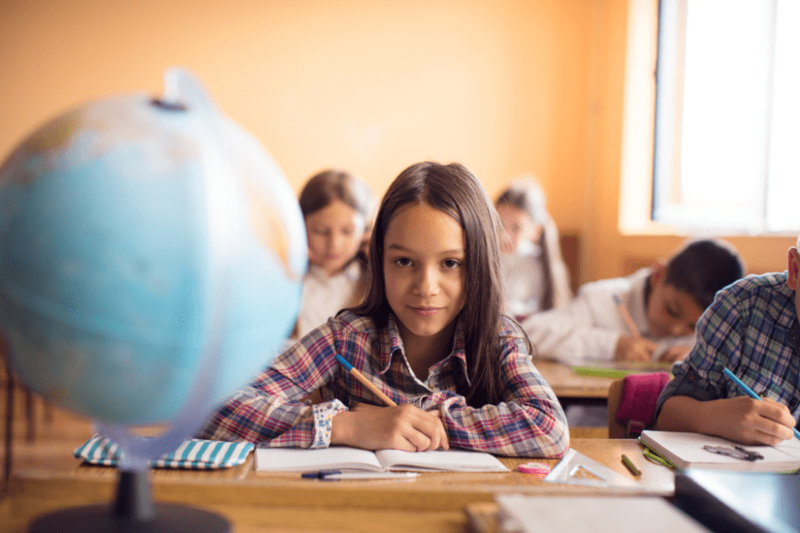 Here are six simple social studies activities for grades K-6 that incorporate reading and writing. Activities are adapted from HMH Kids Discover Social Studies, a curriculum that uses graphic magazines with hands-on lessons and activities to support literacy instruction. After reading , start a discussion with your class by asking questions like these: How can you help people at home? What can you do to take turns in school? How can you show respect for people in the community? Then have your students make posters that show ways to be a good citizen at home, in school, or in the community. Have them share their creations with the class. Have students make a class book on how geography and climate affects the way we live. Students will find the information to create the pages by reading this magazine about where we live. Ask students to compare their community to another by asking questions (e.g., Is it near water or mountains? Is it on flat land? What is the weather like? How do these things shape the way people in the community live?). Have students draw pictures of people in each place, showing the clothing they wear, food they eat, homes they live in, how they get from one place to another, and the things they do to have fun. Write a sentence under each picture explaining how location and weather shape the way people in the community live. Put all the students’ pictures together to make a book. Show students how to make a chart with three columns, one for each branch of the U.S. government. Then have them fill in the columns with information they learn from reading this magazine about leaders and government. The chart should explain the responsibilities of the executive, legislative, and judicial branches and include the names of important positions for each branch. Encourage students to use color and pictures to communicate their ideas. Students get show what they’ve learned from reading this magazine about settling the land by imagining they’re early settlers in your community and writing a letter to a friend or relative in another part of the country. Students should invite that person to come and visit by describing the area, explaining why the person might want to settle there. Students work in pairs to create museum exhibits and pamphlets after reading this magazine about U.S. landscapes. Have kids imagine they work for a museum that specializes in exhibits about your area and let them create a two-part exhibit. One part is a model of the landforms and bodies of water in your area. The other part is a written report about these features, as well as the climate, plants, and wildlife. You can also ask them to compare your area with other areas. Students can review the information in the magazine, and do additional research as needed. After reading this magazine about the new nation, students get to pretend they’re star reporters living at the time of the War of 1812. Their first assignment is to interview Francis Scott Key, the person who wrote the poem that would become “The Star Spangled Banner.” One question could be about his experience witnessing the Battle of Fort McHenry. Others might be about specific parts of the poem. reports on Ancient Rome. Kids can decide on a clever name for the paper, and choose people, places, and events to include in various sections (e.g., weather report, obituary, biography, articles, etc.). They can illustrate the newspaper with drawings and advertisements that relate to that time.